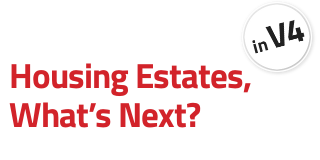 Audio & Video | Housing estates, what next? As part of the project, Lecture Series took place in Prague in between March and June 2014. The whole cycle was divided into two parts. In first three lectures professionals from Poland, Hungary and Slovak Republic presented the state of housing estates urban renewal, institutional support, and realized or prepared interventions in their countries. Consequently Czech experts discussed the topic from practical, philosophical, and sociological point of view.